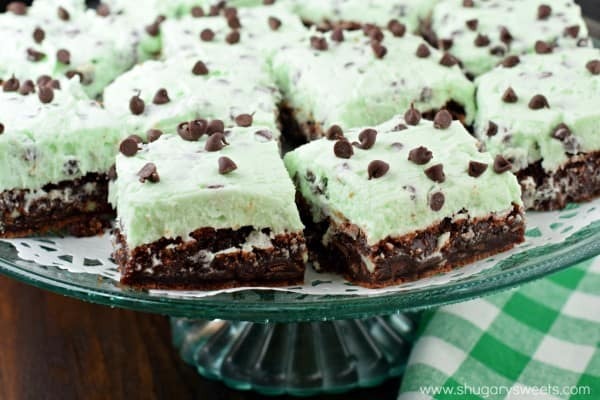 These thick and fudgy Mint Chocolate Chip Brownies are rich and decadent brownies topped with a sweet mint chocolate chip buttercream frosting! We are serious mint chocolate chip lovers in this house. So much so, that many years ago I made this crazy Mint Chocolate Chip Cake for my son’s birthday! 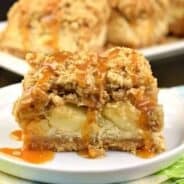 It was dreamy, and decadent, and has been made several times since then! But I don’t stop with just brownies when it comes to mint chocolate chip! I love it with cupcakes, cookies, and fudge too! Today though, we are all about the brownies. 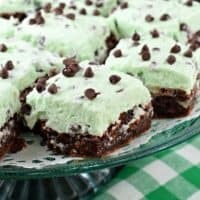 Since St.Patrick’s Day is just around the corner, I found it only fitting that I create a green dessert for your enjoyment! The base of today’s brownie is my favorite recipe of all time. 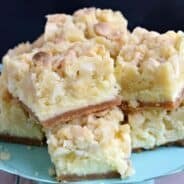 It’s based off these Buttermilk Brownies! 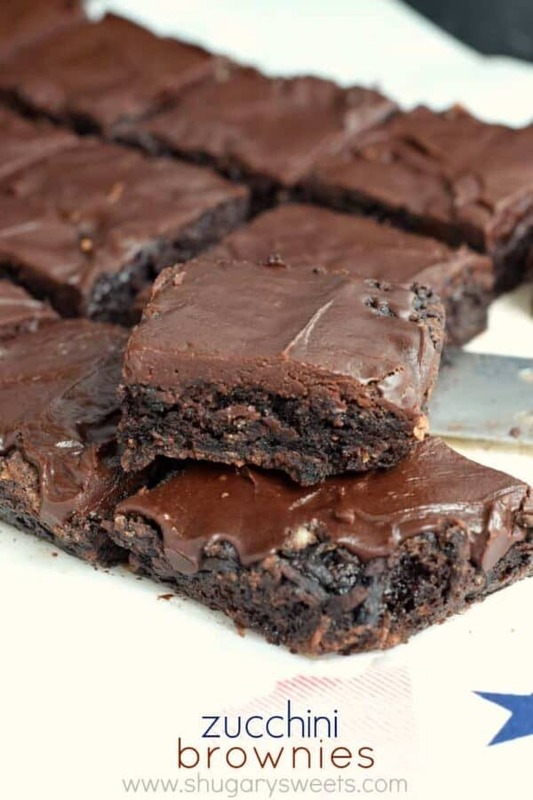 Once you give this recipe a try, I guarantee you won’t need another brownie recipe, ever. It’s so easy to whip up a batch of homemade brownies. I know buying the boxed mixes are easy and convenient…but today’s recipe is super delicious, you may never buy a boxed mix again. If you’re looking at the ingredients list and thinking, I don’t have BUTTERMILK, it’s okay. You can either use regular milk, or make your own butter milk by adding 1 tsp of lemon juice to your 1/4 cup of milk. Whisk it together and let that sit for about 5-10 minutes (it may slightly curdle, that’s a good thing)! I like to under cook my brownies just a minute or two to give a little fudgy center. If you like them a little less soft, add a couple minutes to the bake time! Speaking of soft, fudgy brownies, these are more dense than cake-y. So if you’re looking for them to be dry (even after adding a few minutes to the baking time) that isn’t going to happen. I use the least amount of flour possible to keep these rich and decadent. If you TRULY want a cake-like brownie, you can try adding in a little more flour. But, why? haha!! And now…the frosting. The most magical part of these brownies. Well, no, that’s not true. I do love the base of these brownies, but if you know me, you know that frosting is my jam. My love. MY TRUE LOVE. Which is why, as you can see, I like a good ratio of brownie to frosting. If that’s not your thing…feel free the cut the frosting recipe in half. But, why? The key to giving this frosting a whipped texture (and not a heavy buttercream texture…even though it IS buttercream) is to beat the butter for about 3-4 minutes BEFORE adding anything to it. You want to whip it with an electric mixer (with the whisk attachment) so that it’s pale in color. This will let you know it’s time to add in the other ingredients. Then, once it’s all been added (except for the mini chocolate chips) you’re going to BEAT it another 3-5 minutes. Light and fluffy! You can add in a little more milk if needed, too! Fold in those mini chips and time to spread it on your cooled brownies. 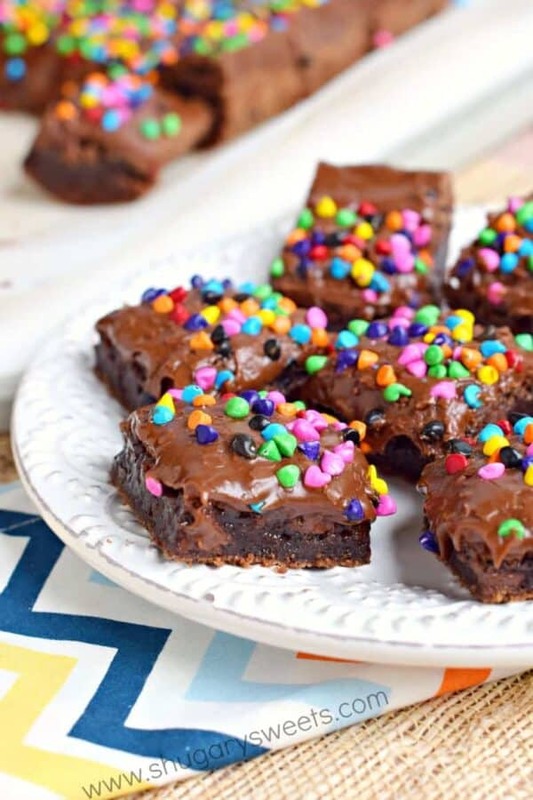 Rainbow Chip Brownies: based off my favorite buttermilk brownie recipe, these give Little Debbie a run for their money! Zucchini Brownies: I’ve packed some veggies in this brownie. It adds moisture and the kids will never know! Milky Way Brownies: thick and fudgy with a frosting to die for! Rich and thick, these fudgy brownies are topped with a sweet mint chocolate chip buttercream frosting! 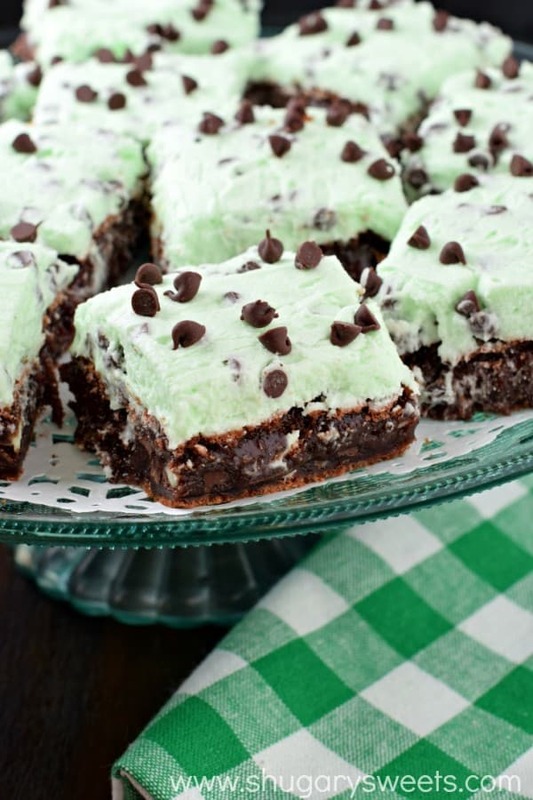 Behold, the Mint Chocolate Chip Brownies recipe of your dreams! Preheat oven to 400 degree F. Line a 13x9 baking dish with parchment paper. Set aside. For the brownies, in a small saucepan over medium high heat, combine butter, cocoa powder and oil. Bring to a boil, whisking continuously, and remove from heat. In a large mixing bowl, combine the granulated sugar, eggs, and buttermilk. Slowly add in the butter mixture (do not over mix). Add in flour, baking soda, and salt, stirring just until combined. Fold in Andes mints. Pour into prepared dish and bake for 20 minutes. Remove from oven and cool. Once cooled, prepare the frosting. In a large mixing bowl, using an electric mixer, beat butter for 3-4 minutes. Do this until the butter becomes pale in color. Add in milk, sugar, peppermint and food coloring. Beat an additional 3-5 minutes until frosting is light and fluffy (add more milk if needed). Fold in chocolate chips. Spread over cooled brownies. Refrigerate for two hours, until set. Cut and enjoy. **Use peppermint extract NOT mint extract. I find the mint has a toothpaste flavor to it! These are so dang purty, Aimee! Seriously, that pillowy layer of mint frosting on top is just so incredible. I want to take a nap on it and then eat it all! Once you find the best brownie recipe, no mixes ever needed again! It’s the best! I feel like these were meant for me! 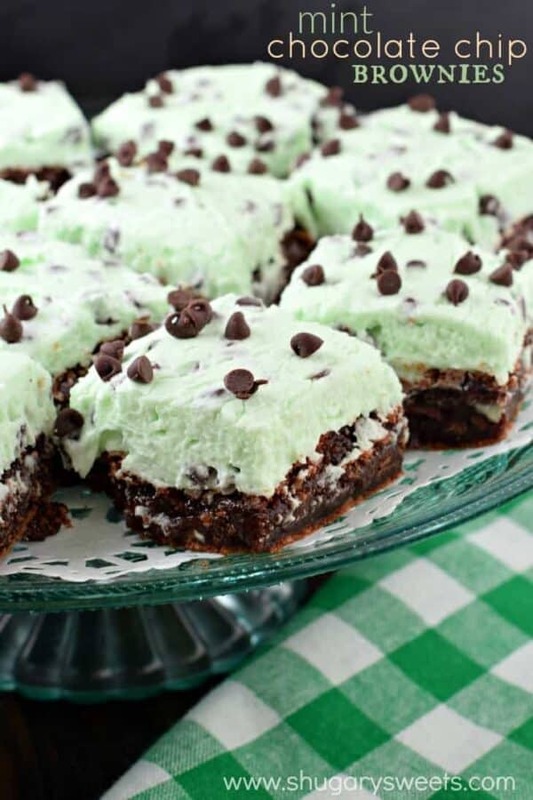 I love the mint and chocolate combination and these look so darn good! These look wonderful. I love mint choice. chip. I have not been happy with the homemade brownies I have made. I need to try these. OMG!!!!!!!!!!! That frosting . . . . . . these look like the best brownies ever!!! Magical Aimee! I love mint chocolate too, or chocolate anything really! Love how fluffy your beautiful frosting looks. Pinned! I LOVE the combination between mint and chocolate. Thanks for the recipe. The brownies are looking great, I’m going to try them for sure! Could you make this Cherry flavored. And what could you use. Grenadine or Maraschino cherry juice. What do you think? Thanks for putting up this recipe. I love the combo of chocolate and mint. The brownies came out beautifully, with a nice shiny top, but when I made the frosting, it was like soup. I have been baking a long time, and I usually just make frosting by feel, but I thought I’d follow your recipe. I ended up having to add around 7 cups of icing sugar instead of 4. Any idea what happened? Also, what do you think would happen if I used all butter instead of half butter, half oil? I found the brownies to be a little oily on the bottom, and my usual go-to brownie recipe calls for all butter. Just wondering if you’ve tried it. The taste is fantastic, as is the texture, but like I said, mine came out somewhat oily. Yummy. 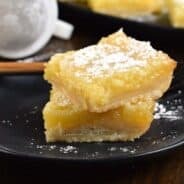 I made these for a dinner party and they were a huge hit. I skipped the chocolate glaze since I don’t own a pastry bag. They still turned out amazing. These are heaven. I love chocolate and mint together. And that frosting is to die for. Huge fan of mint, these look incredible! I can’t wait to try these!! They look incredibly delicious!! 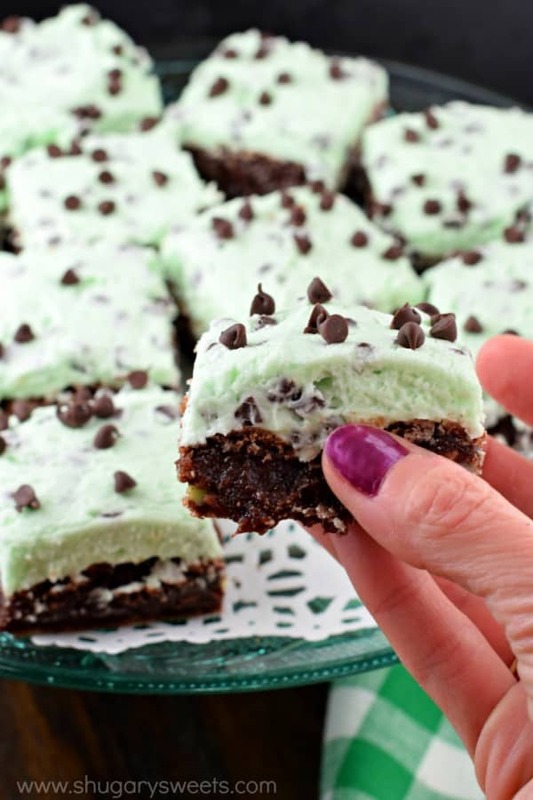 I love mint and chocolate together, and these brownies did NOT disappoint! I loved them so much that I’m going to make them again for St. Patrick’s Day! 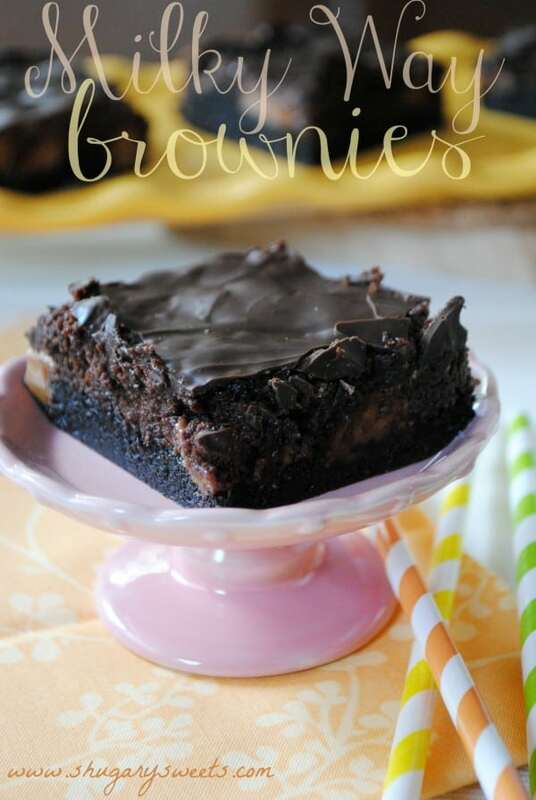 My kids will LOVE these brownies, I can’t wait to make them!